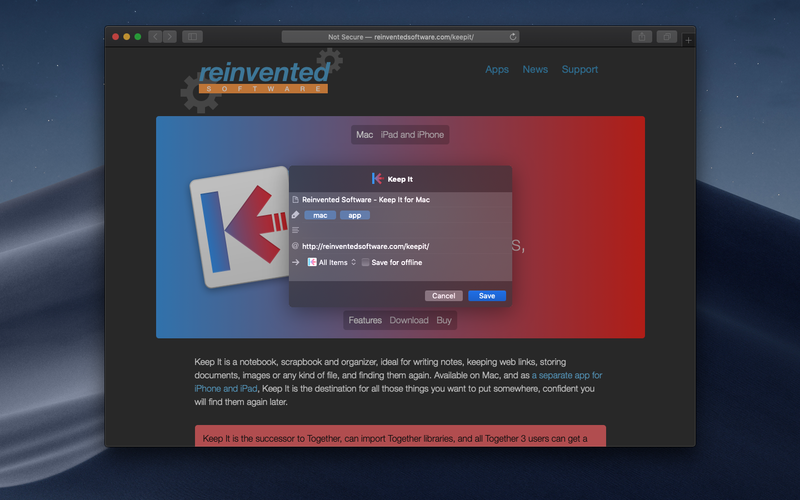 Keep It is the successor to Together, can import Together libraries, and all Together 3 users can get a discount to upgrade to Keep It. See Information for Together Users below. Create notes with built-in styles that look good and read well on all your devices. Notes can contain checklists, bulleted and numbered lists, links, dividers, images and other attachments. Any kind of file can be created from stationery, added to Keep It or saved to its folders, and then opened for editing in other applications. With iCloud, changes are automatically made available across all your Macs and iOS devices. 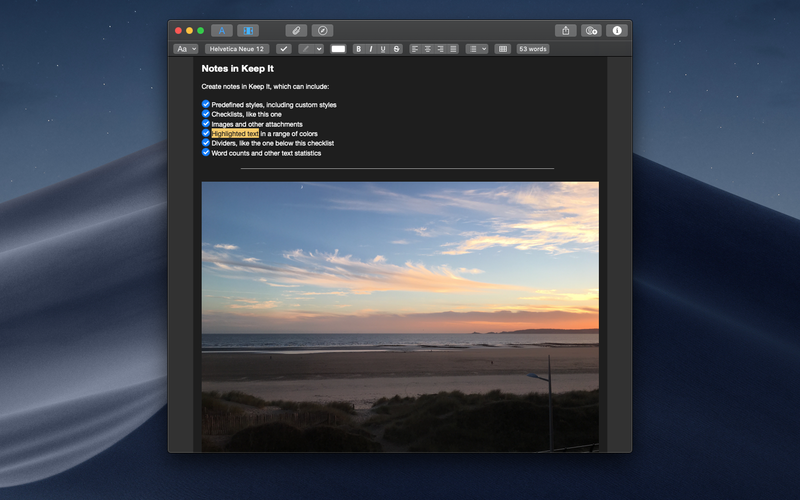 Keep It generates thumbnails and summaries for most files, can edit its own notes, rich text, plain text and Markdown files, add highlights and notes PDFs, and show images, web pages and most other documents. Any item can be encrypted with a password. Keep It can store everything in iCloud and make it available across all your Macs, and your iPad and iPhone too, with Keep It for iPad and iPhone. Folders let you organize items and bundles hierarchically, when needed. 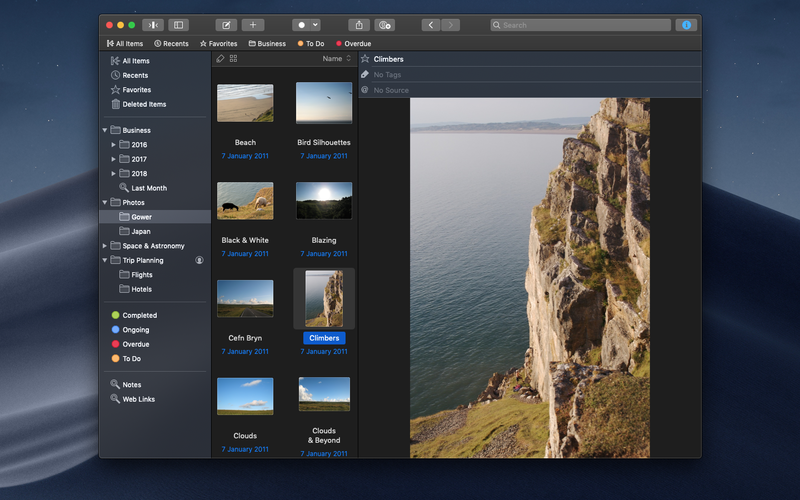 Select a folder to see everything it contains, double-click to focus the sidebar on that folder. Keep It can search the content of most files, and can recognize text in scanned PDFs and images. While searching, suggestions appear as you type, allowing you to narrow down results to exactly what you need. Save searches for later reuse. Keep It’s Tag Filter makes finding things by tags easy, and works with search and the selected list. Choose a tag to see all the tagged items and any other relevant tags; choose another tag to drill down further. Keep It stores everything you add as files, folders and tags in the Finder that mirror what you see in the app, rather than stuff everything into a database. You can even save new files to these folders to automatically add them. This approach lets Keep It work with the system and all your existing apps, files can be searched with Spotlight, backed up with Time Machine, and opened in any suitable app for editing. Tasks in Keep It can be automated with AppleScript. 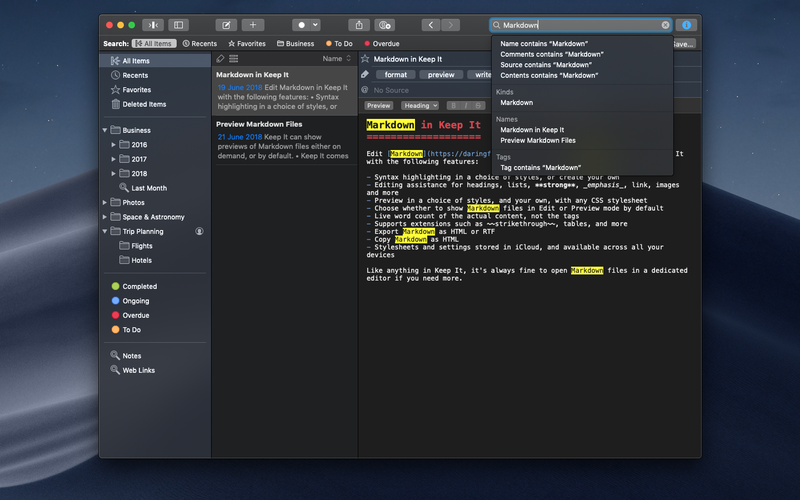 Edit Markdown files with syntax coloring and a choice of editor and preview styles. 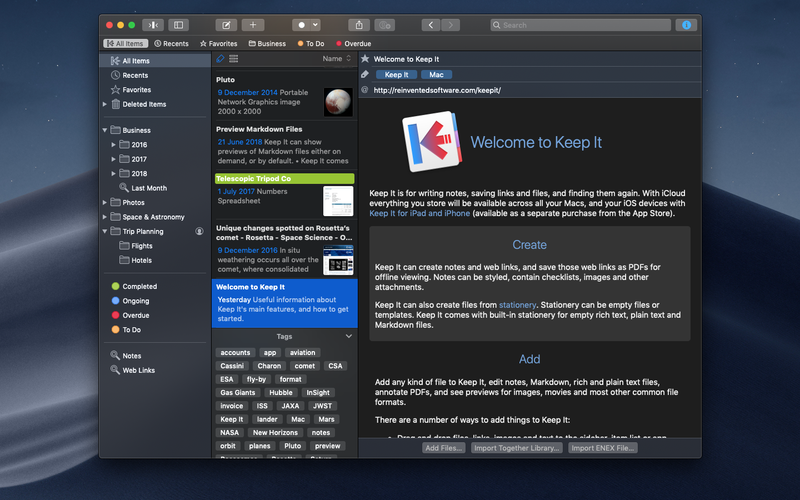 …but just about everything in Keep It is more refined, works better, faster, and often makes more sense. See Keep It for Together Users for more. Together 3 users can get a half-price discount when moving to Keep It, and free licenses are available for anyone who purchased Together 3 in the 6 months before Keep It was announced. See the Keep It Support page for information on obtaining these discounts, and how to move from Together to Keep It.